Easy to Set Alarm Timer Medication Reminder. 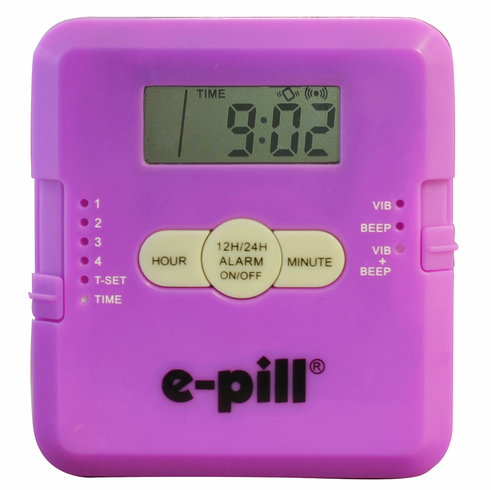 This Pocket Pill Box is compact and discreet with a strong Vibrating Alarm, along with the option for a loud Beeping alarm. It will alarm up to 4 times each day, and the alarms automatically reset every day. The pill box on the back holds all your medications. Popular with Parkinson's patients. Never forget to take your medications again! FIVE Stars / FAB-U-LOUS. Just LOVE THIS - It's worth every penny! My 88 year-old mom "needed help" remembering when to take her meds, and this simplifies it SO MUCH! It was pretty much self-explanatory right out of the box, and super-easy to set. We use it with 4 alarms a day. We don't store her pills in it, so I don't know how that feature works. The alarm is loud enough to wake her up when she's napping, and vibrates quite strongly, to alert those who can't hear at all. If this broke, I'd instantly order another! L.C. Size: 2 3/4 inch x 2 1/2 inch x 7/8 inch. Weight: 3 Oz (with Batteries). Capacity: 8 Aspirin sized tablets per compartment. 4 medication compartments located on the back of this e-pill Medication Reminder.